Here's another new species for you gosshounds: Miragaira longicollum, or "long-neck from Miragaia village, Portugal." This is a new stegosaur with a twist--look at that neck! Photo credit by Dr Octavio Mateus. 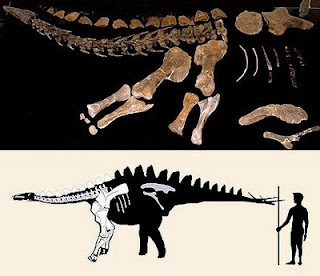 As Tom Holtz pointed out on the DML, first we had Brachytrachelopan, the stegosaur-like short-necked sauropod, and now Miragaia, the long-necked stegosaur. Then he cryptically adds that there's another new dinosaur coming out that wants to belong to a different suborder... Could it be a long-necked theropod? Not that we don't have any, but maybe a long-necked 'carnosaur'? Or a short-necked ornithomimid? Or a flying ornithopod? Stay tuned to find out! As the Everything Dinosaur blog is speculating, Miragaia might have implications for the old debate (and SVP poster joke) about bipedal stegosaurs. Long necks usually mean high browsing, dontcha know. Well, the Goss would point to diplodocid sauropods (which are now known to have had straight necks held close to the ground for low browsing over a wide area) as possibly a better example. But given the long back legs of stegosaurs and very robust forelimbs of Miragaia (maybe for doing "push-ups" into a bipedal or tripodal stance? ), and the fact that the neck is pretty high from the ground, so unless it was wading shoulder-deep in ferns... Well, who knows? More opinions likely to come!